My latest op-ed, title above, appeared in The Virginian-Pilot Thursday. The report (pdf) which sparked my interest was prepared for the Virginia Hospital & Healthcare Association. In my research, some of which appeared in my op-ed last week, I was struck by the fact that Virginia ranks 48th in per capita Medicaid spending while being ranked seventh in per capita spending. The governor indicated in his State of the Commonwealth address that we will not participate in an expansion of Medicaid. Perhaps the governor has information that is different from that provided in the Chmura Economics & Analytics analysis – but if so, he’s not been forthcoming with it. I fully understand the concern regarding the federal government reimbursement for the expansion in the out-years. But that doesn’t mean we should reject it now. If it turns out that the federal government reimbursement drops to its existing rate – 50% – there is nothing to stop the General Assembly from revisiting it at that time and reducing coverage. 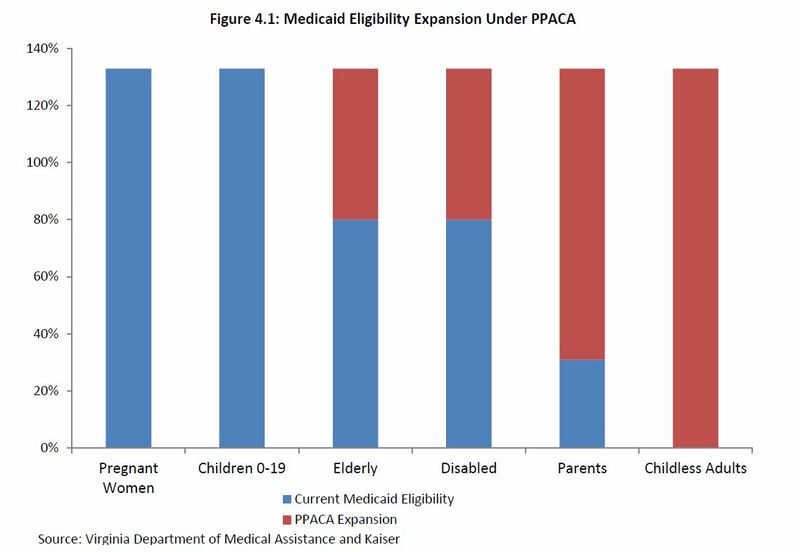 But for now, it seems they should expand Medicaid. The U.S. government has put the States into a kind of Prisoners’ Dilemma. First, it takes our money, then offers to give some of it back to us (not all, of course) if we spend more of our money on what it wants. If none of the States takes the deal, we’re all better off. But if some take the deal, they are better off than those that don’t, because those that don’t still have to pay for it. McDonnell is doing the right thing for the nation. Sometimes we have to make sacrifices for the greater good. No, he’s picking and choosing. One of the reasons behind getting more transportation money in our state coffers is so that we can qualify for federal matching funds. So he’s perfectly willing to accept the road money and all the other money that comes into Virginia from the federal government – we receive more federal largesse than any other state – but when it comes to this, a line is drawn. Or is it that all of those other things are more important than the health of poor people? He doesn’t have a bunch of other governors also declining transportation funding. Mostly, our “federal largess” is just the U.S. government’s having facilities here.